Niemann–Pick disease type C1 (NPC1) is a lysosomal storage disorder caused by genetic defects in the NPC1 gene that encodes an integral membrane protein required for endosomal and lysosomal cholesterol homeostasis . NPC1 disease is characterized by the aberrant accumulation of unesterified cholesterol, sphingosine, and sphingomyelin within late endosomes and lysosomes. Patients manifest with liver damage as well as progressive neurodegeneration, with associated reduced muscle tone, problems with speech, seizures, and early onset dementia. NPC1 is increasingly recognized as a complex defect in the degradation of intracellular components. NPC1 has been identified as a cholesterol sensor that controls the kinase mammalian target of rapamycin (mTOR) . Mutations in NPC1 abrogate its mTOR-inhibiting capabilities, tipping the balance away from lipid-degrading autophagy (lipophagy) and causing toxicity for neurons and hepatocytes . The accumulation of sphingosine during this process depletes lysosomal calcium  with subsequent accumulation of the other sphingolipids. Consistent with this, markers of autophagy flux disruption such as p62 and LC3-II were increased in patient-derived induced pluripotent stem (iPS) cell-hepatocytes . The use of rapamycin, the primary inhibitor of mTOR, and HP-β-cyclodextrin, a cholesterol pore molecule licensed for the treatment of NPC1, normalized aspects of the storage phenotype. Additionally, M-β-cyclodextrin treatment successfully increased autophagosome formation and rescued autophagic flux . These results suggest that lipophagy is key for understanding many aspects of the NPC1 phenotype  (Fig. 1a). In addition to its neurodegenerative phenotype and hepatotoxicity, some patients also manifest the typical pathology of Crohn’s disease, including perianal fistulas and granuloma formation , suggestive of a substantial contribution of the NPC1 gene to the regulation of immune function. Even though patients with NPC1 have no major abnormalities in B, invariant natural killer (iNK) and T cell frequencies or functions , bacterial clearance in phagocytes is defective . Due to autophagic flux perturbation, dysfunctional macrophage responses toward the Crohn’s disease-associated adherent-invasive Escherichia coli as well as Salmonella enterica serovar Typhimurium were observed  (Fig. 1b). This bacterial handling defect was observed at baseline as well as in response to muramyl dipeptide-driven bacterial clearance (a pathway that is well known to be defective in Crohn’s disease), illustrating the involvement of NPC1 in innate immunity. 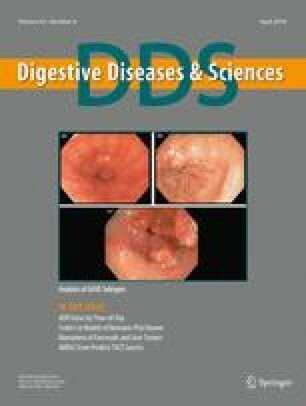 In this issue of Digestive Diseases and Sciences, Cougnoux et al. investigate the gastrointestinal immunopathology of NPC1-deficient Balb/c mice . The authors identified mild histological hallmarks of intestinal inflammation including crypt abscesses. Similar to the human NPC1 bacterial handling defect, E. coli survival was increased in NPC1-deficient murine macrophages. Moreover, inflammasome activation was observed as indicated by increased levels of NLRP3 and cleaved caspase-1. While Cougnoux et al. very carefully point out that the model does not fully recapitulate severe forms of intestinal inflammation in humans or in mice, they note not only that the NPC1-deficient mouse has delayed neurodegeneration on the Balb/c background, but also that this strain background is less colitogenic. In C57Bl/6 mice, a background often used for mouse colitis models, NPC1-deficient mice do not survive until the optimal age required for colitis assessment. To avoid the confounding effects between neurodegeneration and colitogenicity, a potential experimental strategy might be to generate cell type-specific NPC1-deficient macrophages on the C57Bl/6 background in order to interrogate gut inflammation. In addition to its cell intrinsic innate defects, Cougnoux et al. show an altered intestinal microbial composition in the NPC1-deficient mice using 16S rRNA sequencing. There was an enrichment of ε-proteobacteria (Helicobacter hepaticus and Campylobacter) and Cyanobacteria, possibly reflecting a direct effect of the NPC1 deficiency or an indirect effect of the mild intestinal inflammation. Although it would be interesting to compare these findings with the microbiota in patients with NPC1, interpretation of clinical findings may be subject to several confounders. For instance, dietary restriction, repeated antibiotic use, administration of proton pump inhibitors (to reduce gastroesophageal reflux and pulmonary aspiration of acid) are all environmental factors that affect NPC patients and are well recognized as modifiers of the composition of the intestinal microbiota. Consistent with the emerging key contribution of NPC1 toward the maintenance of the endo-lysosomal homeostasis and autophagy is the recognition that the NPC1 endosomal/lysosomal checkpoint can be exploited by pathogens (an acquired NPC1 defect). For instance, Mycobacterium tuberculosis, known to subvert or neutralize the cell’s host defense strategies by impeding lysosomal fusion with endosomes, can inhibit NPC1 via mycolic lipids contained within the bacterial cell wall . Specifically, inhibition of NPC1 produces an NPC-like phenotype with reduced cellular Ca2+ levels and lipid accumulation. Given the contribution of M. tuberculosis toward NPC1 inhibition and the resulting foam cell and granuloma formation within tissues , it is tempting to speculate that other non-pathogenic bacteria could also contribute to granulomatous colitis in susceptible hosts (Fig. 1c). Functional NPC1 might also be a pathogenicity factor for viruses. In a genome-wide screen, NPC1 mutations in human chronic myeloid leukemia-derived HAP1 cells arrested their productive infection by Ebola virus . NPC1 was required in the later steps of infection involved in viral glycoprotein membrane fusion and the release of the virus from the lysosome [12, 13] (Fig. 1d). In this setting, heterozygous loss-of-function variants in NPC1 might serve as an evolutionary selection advantage explaining the maintenance of disease-causing variants in NPC1 in the general population . Taken together, these studies suggest a model where loss-of-function mutations in NPC1 patients or mice impair phagocyte bacterial handling. NPC1 emerges as a regulator of autophagy orchestrating the immune response of the host toward certain pathogens, especially in the case of the Crohn’s-associated adherent-invasive Escherichia coli. Certain bacteria and viruses target and exploit NPC1 as an “Achilles heel” for the cell. Nonetheless, understanding of the autophagy process, in particular lipophagy and xenophagy defects, can contribute to the development of treatments for lysosomal clearance and enhancement of pathogen removal. Furthermore, NPC1 might serve as a temporal robust target for therapeutics to combat filoviruses. NPC1 appears to be an excellent example of how diverse phenotypes found in Mendelian-inherited disorders inform broader aspects of cell biology and immunobiology. Cougnoux, A., Movassaghi, M., Picache, J. A., et al. Gastrointestinal track pathology in a Balb/c Niemann–Pick disease type C1 null mouse model. Dig Dis Sci. (Epub ahead of print). https://doi.org/10.1007/s10620-017-4914-x.